Wellllllllllllll, we got home from Beijing on Thursday and on Monday I got a wild hair to go to Kunming. You see Kunming, the city of Eternal Spring is Charlie's birth city and a GREAT place to visit soooo on Tuesday I bought plane tickets from Beijing to Kunming and train tickets back to Beijing and on Wednesday we left. Yes it's true I was born in the sign of the foot and I don't believe in letting any grass grow under it. So far this winter break the girls have been to school for one week and one day. On this trip only my friend Nancy accompanied us. You know there are so many things we take for granted in the US, I mean things that I thought everyone knew. You know how we all tend to ignore the airline stewardesses when they are giving their speech on where the oxygen bags are and how to buckle a seat belt???? Well we didn't pay any attention to them here either. I'd buckled the girls in and glanced over at Nancy who was fumbling with her seat belt. It never dawned on me someone wouldn't know how to fasten a seat belt, but when you stop and think about it, few people own their own cars here. Most everyone rides the bus or in taxi's, neither of which have seat belts. So I reached over and showed her how to buckle up. About half way up to our cruising altitude Julie began complaining that her ear hurt. She'd been fighting a stuffy nose and I think it must have plugged up her ear as well. About a minute after she started saying her ear hurt I guess the pain really became something because my mild mannered little daughter was now crying hysterically, kicking her feet and practically screaming with pain. Nothing worked, we tried yawing, sucking fingers, holding her nose and blowing, chewing gum. Finally in desperation I remembered a trick I'd heard once and had Nancy ask the stewardesses for a paper cup and a wash rag that was wet with very hot water. At first they brought me a slightly warm rag and I asked them for a really hot one. I put the hot wet rag in the cup and put it up to her ear. It worked like a charm and her ears popped. I think the stewardesses will remember that one. After Julie stopped crying, Nancy handed me a handful of tissues to wipe my wet face and eyes off with. I think I was crying as hard as Julie was at that point. The rest of our flight was pretty uneventful. I had a nice new hot rag for our decent. We had no idea where we were going to stay once we got to Kunming. I had the Lonely Plant Guidebook and was just going to get a cab driver to take us to one of the hotels recommended in there. The lady sitting next to Nancy on the plane was a tour guide and she suggested we check with the travel agents located in the airports and use them to get us a room. We did just that and did we ever get a deal. I asked them to show me the hotels that accepted VISA and limited our choices to those. We stayed at a 4 star hotel in downtown Kunming for only $25.00 per night and this wasn't even the cheapest hotel they showed us. We boarded the free shuttle bus and off we went. Nancy and I were really pleased with our find. The posted room rate was over $60.00 per night, but because we'd booked with the travel agents we'd saved a ton of money. After settling into our room we broke out the Lonely Planet and set out on our first adventure. We took a cab over to Yuantong Temple. 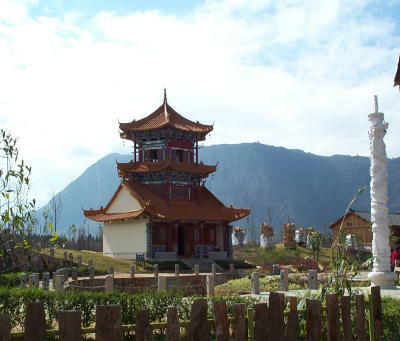 It's the largest Buddist complex in Kunming. 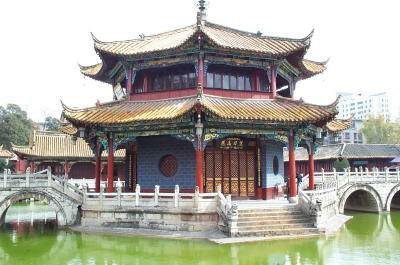 It's over 1200 years old but has been renovated many times. We walked all over the grounds and I ran into another westerner. 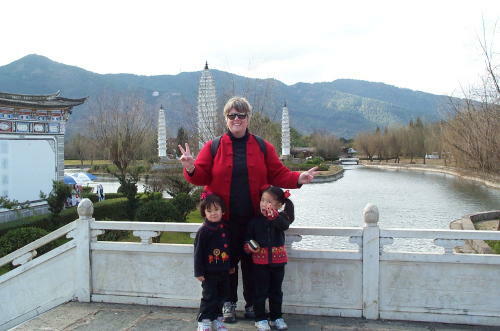 She was a teacher at Yunnan University in Kunming. She was with her mother and aunt who were visiting her (I wish my mother and aunt.....either one of them, would come and visit me...hint hint!!!) 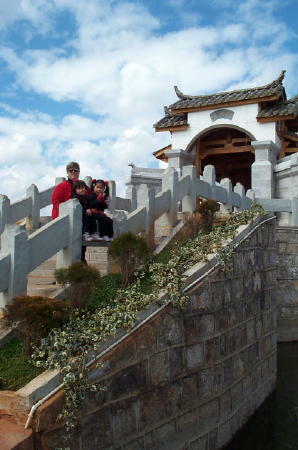 The complex was very beautiful and we spent quite a while there taking pictures and enjoying the scenery. 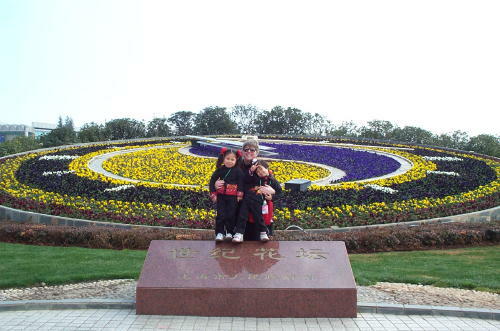 We then headed over to Cuihu Park. It is an absolutely wonderful park in the middle of the city. There were flowers and green plants everywhere. After living in the north where we are in the middle of winter, seeing green living plants was very refreshing. We walked all over the park and stopped to let the girls ride a few rides in the amusement part of the park. There were several people flying kites and we watched them for a while before leaving. I'd seen on the map that Yunnan University was very close to the park, but I didn't realize it was right across the street. The Lonely Planet had said there were several good noodle restaurants close to the main gate of the campus. We found the gate and restaurants as promised. We chose a nice looking restaurant and went in. Nancy ordered for us with some difficulty. 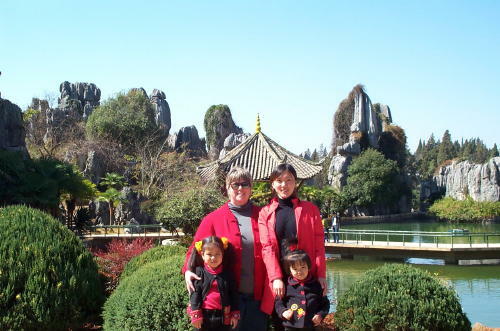 The Kunming or south accent is very different from the northern accent and one more than one occasion Nancy remarked "oh the accent here is awful!" Nancy speaks very standard Chinese and takes great pride in her ability to do so. Here in Liaoning (and I think everywhere in China) all Chinese University teachers are required to take and pass an Oral Chinese test. I think it is the government's attempt to help the citizen everywhere understand each other. 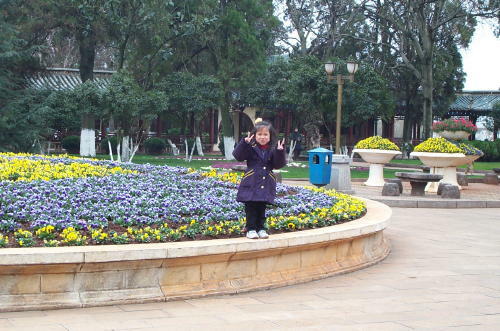 When ever the people in Kunming would start speaking in their local dialect Nancy couldn't understand them. The food was increadibly average. We'd ordered one bowl of spicy noodles and one bowl of plain. I ended up with the spicy ones because I was the only one who could tolerate them, but I gave up after several bites as my lips were on fire. This was the first in a line of quite forgettable meals in Kunming. I've discovered I really prefer the food in northern China. The next day we headed out to the Ethnic Minority Villages. This was my favorite destination of our trip. 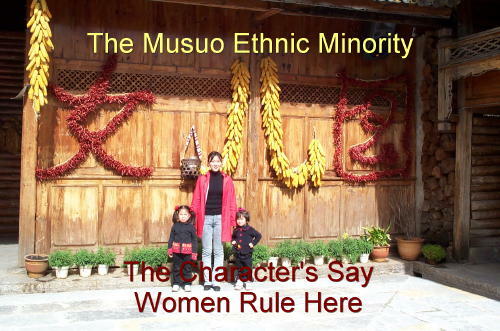 Most of China's Ethnic Minorities are located in Yunnan Provence (Kunming is the capital of Yunnan Provence) and the Village has 12 different ones there. I first visited the EMV in 1999 when I'd gotten Charlie and remembered how beautiful the place was. Of course where you are with a new 1 year old sick baby and 9 other new families, you really don't get to see as much of the place as you'd like. It was also drizzling rain the entire time we were there in 99 as well. This day the weather was wonderful. Most of the day we had blue skies, although we did have about 30 minutes of a very light drizzle. We stayed the entire day and saw all the villages. 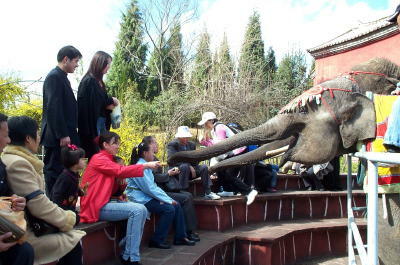 There was an elephant show (Yunnan Provence is the only provence in China where Elephants live in the wild) and it was kind of cheesy, but then a lady came around pushing a cart full of bananas, 3 for 1 yuan. You were supposed to buy bananas to feed to the elephants. We bought several and then the elephants came around. It was great fun to hold the fruit out and let the big tusker take it from you. Charlie was getting kind of cranky and hungry and started eating the bananas. I believe her comment was "I want the banana's not the elephant." At the Bai Village I bought the girls some more Bai costumes in a larger size. One of my favorite purchases in 99 were the small ones I'd gotten for them (you can see the picture of them wearing the costumes on my web site) I also bought 2 Yani costumes for them. 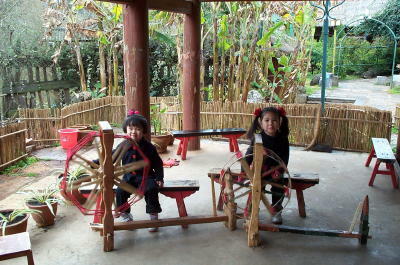 The Bai should fit them when they are around 8 or 9 and the Yani when they are around 12. I figured they will be taking social studies when we get home and I remember doing special projects on different countries and thought these would be nice for those. When we left late that afternoon, Nancy figured we'd been walking for over 6 hours. I was totally exhausted. We hit the market right next to the hotel and bought some fresh (wonderful!) strawberries and rolls for dinner. I think we were all in bed fast asleep by about 730 that night! I'd met up with an man I'd met via the internet. He used to be a teacher here at LIT and was now married and living in Kunming. He told us of several places we might want to go see that weren't in the Lonely Planet. The first was the Saturday Market......so on Saturday morning off we went. Oh My Gosh....I've never seen so much stuff and so many people crammed into a small space in my entire life. The Saturday market occupies a space about the size of the Tulsa State Fair Grounds (Tulsa's fair grounds are not as big as the one's in Dallas, but much bigger than the one's in my little home town) Anyway I think half of Kunming's population was out there. Talk about some interesting sights. The first area we visited was filled with plants...Oh how I would have loved to bring some of them back with me, there were huge pots of bouginvilla for 10 yuan and equally large azalea bushes for the same cheap price. Then there were clothes and everywhere were vendors selling various things to eat. My personal favorite was the sugar cane man. He had some sort of pulping squeezing machine. It resembled the wringer on an old fashioned washing machine. He placed whole sugar cane into it and it squeezed out the juice into a container in the bottom. Then he placed a cup under a little spout and out came the sugar cane juice....it was really good. There were many people from different Ethnic Minorities there. You could easily spot them as they were the one's with 2 children. How they kept up with them in that crowd is beyond me. Nancy and I each had a child in hand and it was all we could do to hang on them. There were many time's this big mama did her best linebacker imitation trying to open up a hole in the crowd for us to get through. We found a gold mine treasure trove of hair goodies and I bought the girls a huge assortment of really pretty barrettes and scrunchies for next to nothing. Next we took a wrong turn and discovered live supper. I wasn't too fond of seeing dogs and cats next to the chickens and ducks that were for sale. I grabbed Charlie and practically ran out. Nancy was behind me yelling "Karen, wait up" I was ready to go after that. 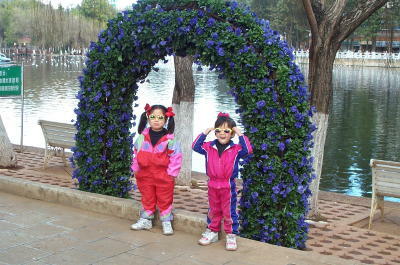 The next day we went to the Horticulture Exposition. When I was there in 99 is was called Expo 99. Now it's just the Expo. This was Nancy's favorite stop. 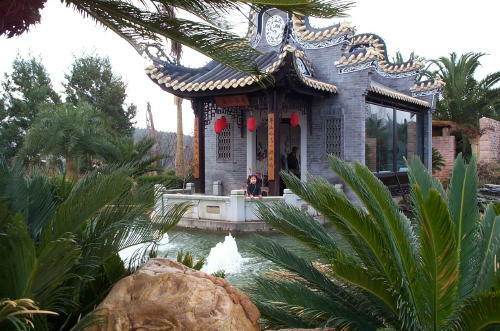 We first went to the Chinese Garden and they were still very lovely, but I think they are prettier in the spring and summer. Even the City of Eternal Spring has a winter season for some of it's plants. 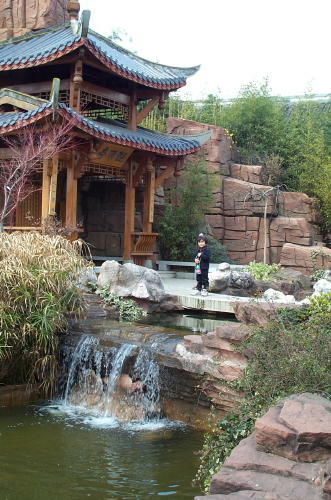 This time I got to see the international gardens as well as the Chinese. The US's garden is a typical West Texas garden. It was full of brown dirt and cactus. It kind of reminded me of my life in San Angelo Texas. All that was missing were some fire ants and Mesquite trees. It was another marathon walking day and we fell into bed that night too. On Monday we went to the orphanage where Charlie spent her first year. We met with the Assistant Director who remembered her and she took us to the main part of the orphanage where the children live. Several of the nannies remembered her as well. When one of the older nannies heard we were there, she came running out of the infants area exclaiming "Guan Xiaoxuan, Guan Xiaoxuan!" We were standing outside the older babies room and she pointed and told us that's where Charlie had slept. She also told us she wouldn't have recognized Charlie, but her eyes were still the same. She also said she always thought Charlie was a beautiful baby, but she had no idea she's be this beautiful. 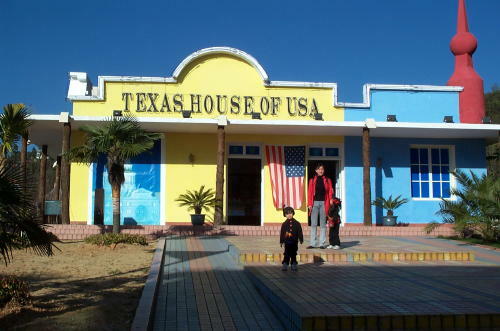 We also met an American who works at the orphanage in the baby area. Her group helps support the baby room. (she didn't remember Charlie though). As we were leaving the Assistant Director asked to take a photo of us, which we happily agreed to do. She then welcomed us to come back when Charlie was older. For the rest of the week the weather did not cooperate and it was very rainy and overcast. It tended to limit our excursions. The girls favorite thing to do was head to KFC for dinner and play in their play area. In our 12 days in Kunming we ate there 6 times. The one we usually went to has plain clothed security men and they got to know us quite well. We even had our usual booth. I finally decided enough was enough and the weather was not going to stop me from having a good time so we resumed our daily trecks. 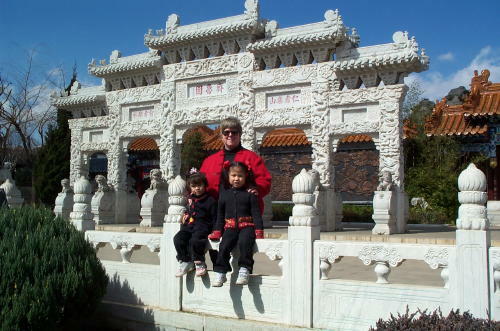 We visited one really beautiful park on the north side of Dian Chi (Lake Dian). We took a ferry type boat across the lake to Western Hills and back. It was quite cold out on the water and I was glad we'd brought our warm coats with us. Nancy informed me this was her first trip on a boat as well. Western Hills was very pretty, but I wish we could have seen it better. The fog/rain/haze really limited our visibility. 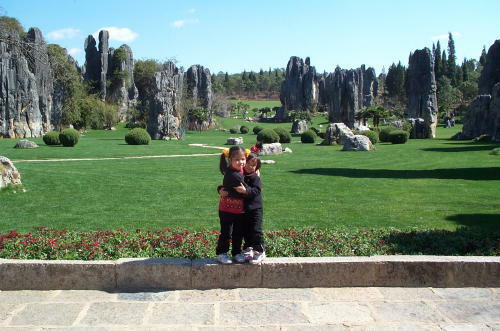 Finally the weather cleared and we called the airport travel agents and arranged for transportation to the Stone Forest. 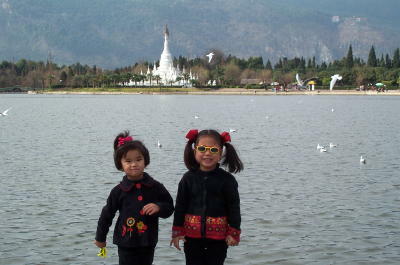 I remember several of the parents talking about wanting to visit here when we were in Kunming in 99. Our guide told us it was really too hard of a trip to take our new babies on and after making the trip I can see why he said that. 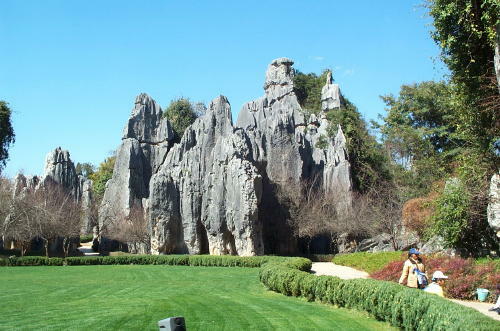 The Stone Forest is about 100 kilometers from Kunming (60 or so miles) which doesn't sound like it would take all that long.....but it takes about 2.5 hours to get there and it's not on a 4 lane super highway. There are several places where we were on unpaved roads, twisting and winding our way through the mountains. It wasn't that difficult of a trip for us, but with babies it would have been miserable. We were stopped twice by policemen doing security checks. The guide told us this was a very important road and it also led to the border and was popular with drug trafficers. All they did was ask to see the drivers license and the busses paperwork so it was no big deal. The scenery on the drive was quite breathtaking. I remember looking up at the mountains during one particular stretch of road and seeing a narrow gage railroad on the side of the mountain and marveling at what a miraculous engineering feat it must have been laying that track. There were several tunnels right through the mountains, huge bridges and areas fortified on cliffs that were built to accommodate the train. I've ridden on narrow gage trains in mountains of New Mexico and Colorado, but I never stopped to think about how difficult it must have been lay the tracks. They are also building what appears to be a new highway through the area. Of course it is requiring massive bridges and engineering work as well. 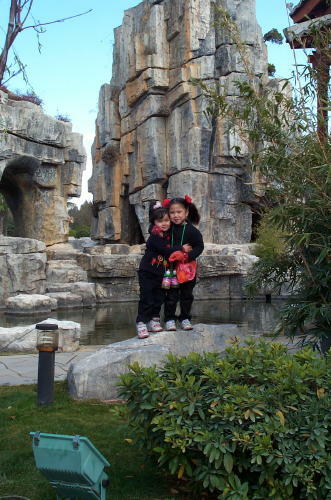 I'm sure once it is completed, the trip to the Stone Forest will be shortened considerably. We reached the Stone Forest about noon, the weather was perfect. We first rode around the perimeter of the forest marveling at the beauty of it. Apparently the entire area used to be under water (like in the ice age) and it caused some really cool limestone formations to erupt through the ground. (I'll post pictures on my web site). 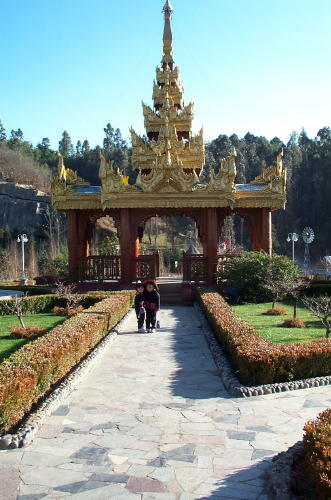 The area is inhabited by the Sani Ethnic Minority and many of them act as guides through the forest. We kind of ditched our group and made our own way through it with Julie and Charlie stopping at every rock to climb and say "here mama, take my picture." Again we shopped and Nancy the queen of the bargainers helped me obtain some really neat souvineers at rock bottom prices. Of course all good things must end and the next day we boarded the plane and headed for home. We got to Beijing about 400 and took an airport shuttle downtown so we could pick up our train tickets. We took the sleeper train on into Jinzhou and were home about 630 am the next morning. I was so tired I couldn't see straight. I put a DVD on for the girls (who slept a WHOLE lot better on the train than I) and laid down for a nap. Charlie crawled in bed with me and we got up sometime about noon, feeling much more refreshed.